Who loves pleasant sunny fall afternoons? Most everyone and everything and that includes a large population of gnats in my yard that have also enjoyed a wet northeast Ohio summer. I had a few minutes to do some yard work today but I was distracted when I walked through a cloud of these small but numerous little inhabitants of my back yard. Rather than work on the shrubbery I ran in to get my camera, of course, because the conditions were ideal for capturing the swarming behavior of these gnats. If you spend time watching many gnats you will realize that they prefer the sun. There are patches of sun in my backyard and at first you might think they are just hard to see in the shade but they really aren’t many in the shade. In fact it is the sun-attraction that makes them a fun target for photography. I could stand in the shade and hardly be bothered by a single gnat while taking pictures of tens of thousands of them not more than 5 feet away. The was hardly any breeze which is necessary for these very light gnats to swarm together. Also, because the gnats where in the sun but I have dark woods around, the gnats were naturally illumined against the background. Perfect for pictures! Below I start with general shots of swarms and then take pictures up close and with longer exposures to show you some of the swarming features of these gnats. The picture above gives you a sense of the size of single swarm and its position above a sunny patch of grass. Above is a smaller column of gnats. After a small breeze disperses the gnats they begin to group again starting near the ground and then rising up in small columns to about 5-6 feet above the ground. At any one time there were 20 to 30 such columns in my back yard. 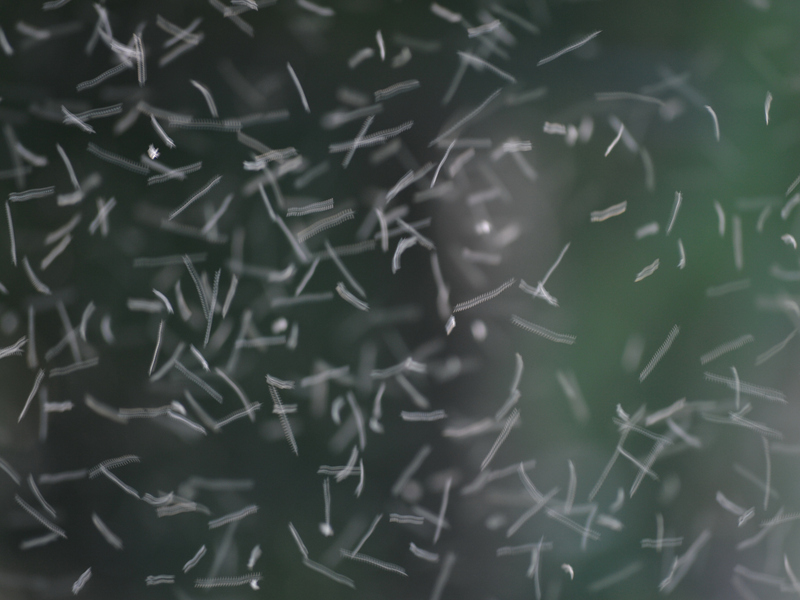 At short exposure times (1/500sec) the gnats look like points of light. I am using my telephoto lens but am standing only about 5 feet away and so the field of view is very small. Manual focus is a must for this. 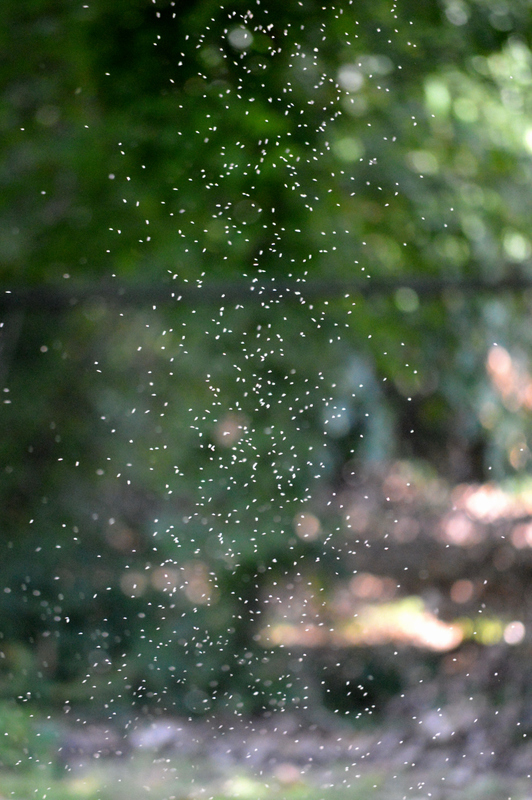 The tiny white gnats look like tiny white paper airplanes. I took pictures with ever increasing exposure lengths. Here at 1/30 second you can see the trajectories of the gnats. What should be obvious here is the gnats in the swarm are moving in nearly all directions though more are moving horizontally than vertically. In this exposure they have probably moved less than 1/2 of an inch and they look like they are going in straight lines. If we slow down the exposure to 1/13th of a second the path the gnats have traveled is more than twice as long and now you can see that most are beginning to take on a curved path. 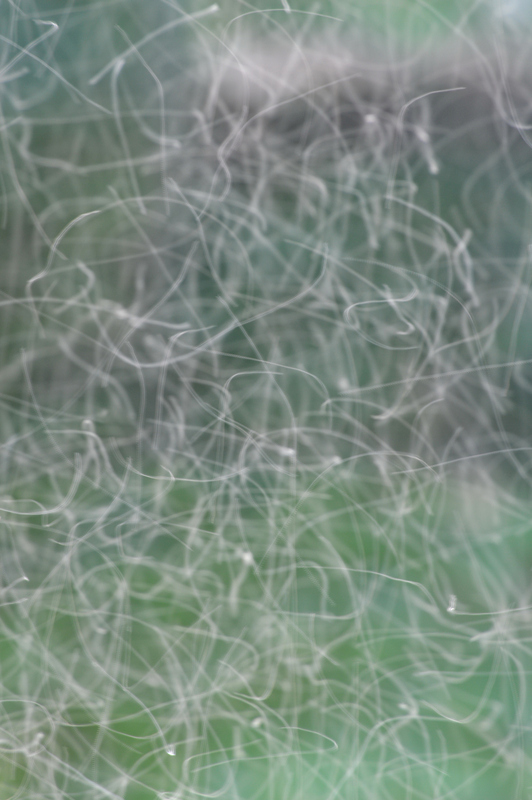 At 1/5 of a second the gnats path looks like a ball of string. Now you can see that they are all turning all the time but there is no pattern in a particular direction. The idea is that each gnat is trying to stay some distance from the other gnats in its vicinity. Since each gnat is in motion and each is watching the other and adjusting their positions relative to that gnat, they end up swarming around each other in clusters. 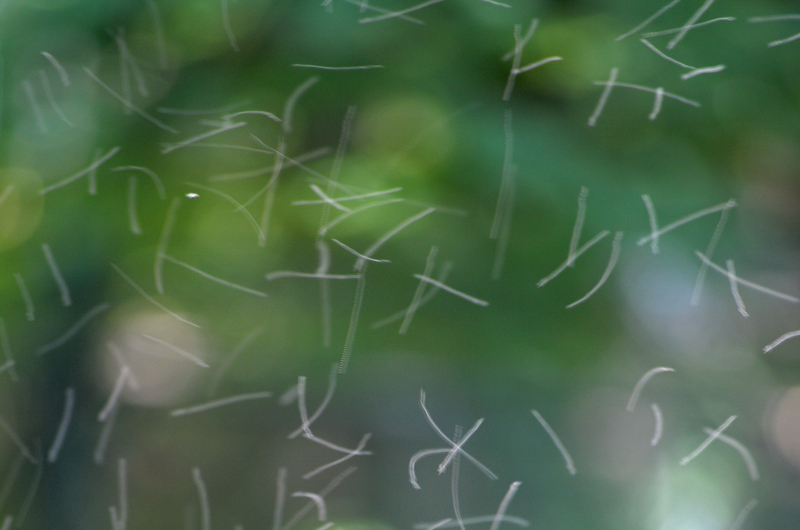 If we look closer at the 1/5 second exposure we can see the wing motions of each individual gnat have been captured. Maybe tomorrow I will work on the shrubs…. Natural Historian — Thanks for a great site! I’ve enjoyed your thoughts and writings much. One quick thought on the gnat photography: Have you tried using a speed light to illuminate only the gnats? This would give you the white specs against a black background. You can do this by putting the flash on the fastest sync speed possible and moving your shutter speed to 1/2000 or faster. This will eliminate any ambient light contribution to the exposure and will allow the gnats to be illuminated solely by the flash. Thanks for the advice. I still have a lot to learn about photography. I have a few things on my xmas wish list that will help including a better flash. i’ll have to give that a try next summer.